Launched in 2009, WhatsApp is probably the most popular instant messaging app created by Brian Acton and Jan Koum who were the former employees of Yahoo. The idea was brainstormed by Jan Koum when he purchased an iPhone in 2009 and found this idea fruitful through the Apple App Store, as Apple used to send push notifications to update its users. Initially, they focused on statuses, later Koum said that he wanted to stop missing important calls during the gym hours. Luckily, they found Igor Solomennikov through RentACoder.com (now freelancer.com) who then developed the app for push notification feature. As soon as the app launched, they received the fruitful response from the users that motivated them to add messaging function, and rest is the history. WhatsApp was a super hit because this free messaging services enabled user to log in using their phone number. Due to its incredible success, they easily convinced a bunch of ex-Yahoo employees to fund $250,000 in the project. Later, WhatsApp introduced the multimedia messaging feature, and also, it was released on Android. It was the turning point of WhatsApp because it ranked as the top three most-downloaded apps worldwide. In October 2011, WhatsApp crossed the milestone of one billion messages daily; while, by 2013, WhatsApp was able to boast 200 million active users. In Late 2017, monthly active users of WhatsApp crossed the figure of 1.5 billion. With this wonderful performance, they attracted Sequoia Capital to invest $8 million in April 2011 and a $50 million more in February 2013, due to which WhatsApp valued $1.5 billion at that time. With such output, Facebook found WhatsApp as one of its major rivals in the near future, therefore, Mark shown an interest in buying WhatsApp and in February 2014, Facebook acquired WhatsApp for $19 billion, which was the largest acquisition that time. Later, both the founders of WhatsApp left the company as they had concerns regarding the data shared between both the companies, although, they promised the data encryption. 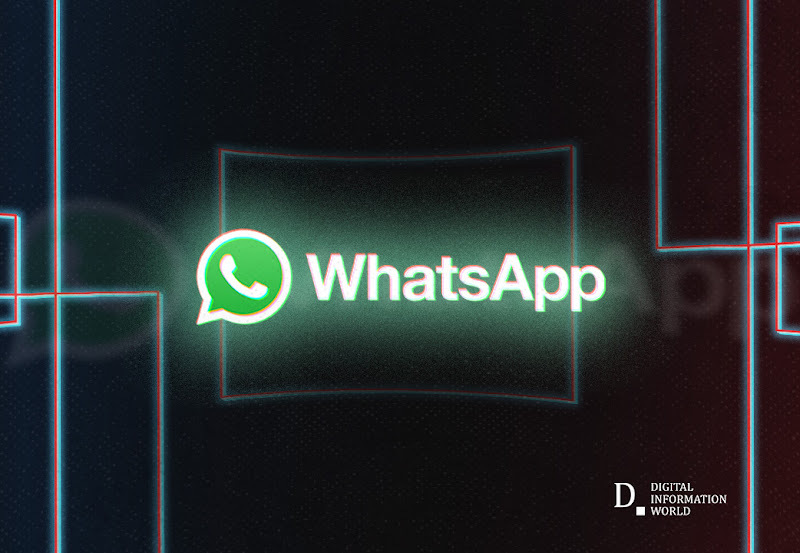 Regardless of all the controversies, WhatsApp is still on top in its sector as it has continuously introduced the newest features including video calling, voice calling, group calls, and WhatsApp Business. Below, we are presenting all the facts and figures about WhatsApp and a comparison with its rivals. WhatsApp has 1.5 billion users from 180 countries that makes it the most popular instant messaging app worldwide. Facebook Messenger is on the second place with 1.3 billion users. There are daily One billion active users. The biggest market for WhatsApp in India with over 200 million users. Sometimes, the figure crosses 300 million. Brazil has 120 million WhatsApp users. Unexpectedly, the U.S. market has fewer shares with 23 million users. The market penetration of WhatsApp is highest in the following markets. The Netherlands with 85%, Spain with 83.1%, and Italy with 83%. WhatsApp statuses have been used by 450 million users leaving Snapchat stories behind. WhatsApp Business has Three million users. 29 million messages sent every minute, while daily WhatsApp messages exceed 65 billion. WhatsApp Video and Voice Calls consume two billion minutes daily. The total number of daily video calls made on WhatsApp is 55 million that takes 340 minutes in total. During May-July 2018, a total of 85 billion hours were spent on WhatsApp. Facebook acquired WhatsApp in 2014 for $19 billion. As per Q4 2017 stats, WhatsApp was able to boast 1.5 Billion monthly users from more than 180 countries. This significant rise in users was noticed when Facebook acquired WhatsApp before the acquisition WhatsApp had one-third of the users as compared to this figure. Moreover, as per the latest statistics as of January 2019, WhatsApp has more users than Facebook Messenger (in top messaging services). 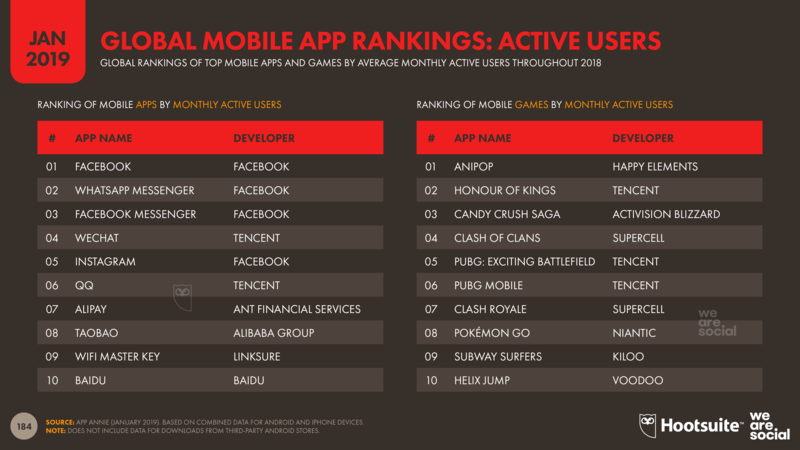 Number third and fourth in the list are China-based apps i.e., WeChat and QQ Mobile. In the Facebook Empire, WhatsApp is in the second position while Facebook is on top, and Facebook Messenger and Instagram are on the third and fourth place. As of July 2017, WhatsApp had 1.3 billion users of which One billion used the app on a daily basis. So, the incredible price Facebook had paid to acquire WhatsApp was based on its potential for growth. In terms of Monthly Active Users, WhatsApp is only behind Facebook while in terms of download, it’s on the third place after Facebook and Facebook Messenger. Now, this is an interesting study. 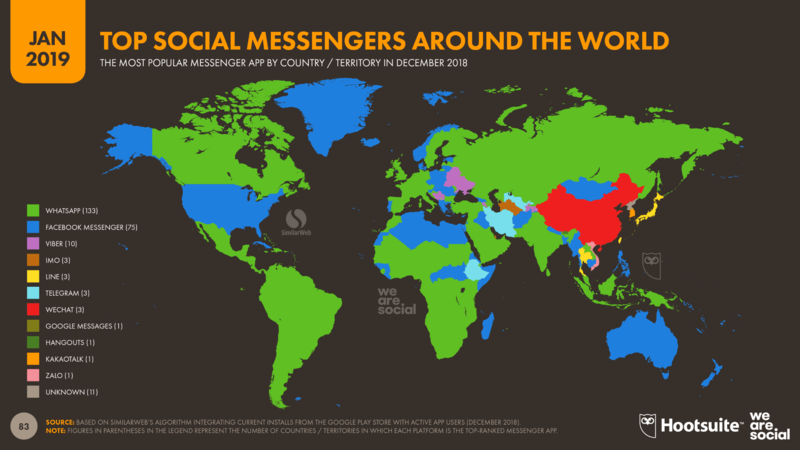 Although WhatsApp is the top instant messaging app, it still needs to capture the top spot in about 25 countries including the US, France, Australia, and Canada as Facebook Messenger has captured the market in this countries. As per the stats, with 200 million users, India is the biggest market for WhatsApp. In terms of market penetration, India is standing between a quarter and a third that is even lower than Brazil, Germany, and Malaysia. The top spot in this list is captured by Saudi Arabia with 73% market penetration. Note: This study was conducted in the third quarter of 2017. On the other hand, another study found that the Netherlands has captured the top place in terms of WhatsApp penetration that is 85% of the smartphone users, with Spain and Italy at second and third place. Moreover, the study predicts that Spain will be overtaken by Italy within 2019. According to this study, the top 5 markets in terms of WhatsApp penetration are European and they will be increased in 2019. As compared to the European countries and other top markets, the US is a small market with 22.5 million users. Although, there were 21.3 million WhatsApp users a year ago, still, the US is dominated by Facebook Messenger which is the more popular choice as compared to other messaging apps. In the United Kingdom, WhatsApp is the fourth most-used platform and it falls behind YouTube, Facebook, and Facebook Messenger on the first, second, and the third place respectively. 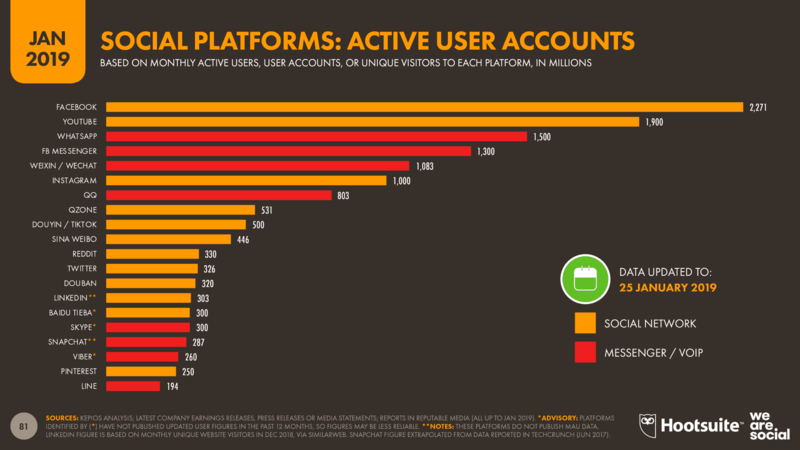 Still, in terms of monthly active users and the most downloaded app, WhatsApp is on top. India’s 200 million users’ figure was found in 2017 and according to the estimates, Indian WhatsApp users could reach 300 million by January 2018. Moreover, WhatsApp is behind Facebook and YouTube in India as 82% of internet users use it. In India, WhatsApp has been misused and have created several issues and problems due to fake news. In the 2018 election, fake news in support of presidential candidate Jair Bolsonaro created hype in the country. Moreover, the major share of Indian users lives in urban areas. These users were increased significantly between 2017 and 2018, i.e., about 16%. Although, in the rural areas, the use of WhatsApp also doubled, still it is far behind than the urban areas. Interestingly, in India, WhatsApp usage is increased in almost all types of users either they are among the wealthiest or ones with lower income, BTW, upper middle class and rich users are on top of the list. If we talk about age, the Youth are the biggest constituency for WhatsApp in India as WhatsApp usage in the age group 18-25 was increased from 30% to 49% in the recent years while the usage in the age group of 26-35 was increased from 21% to 35%. The WhatsApp usage was increased in older age groups too but not more than the youth. 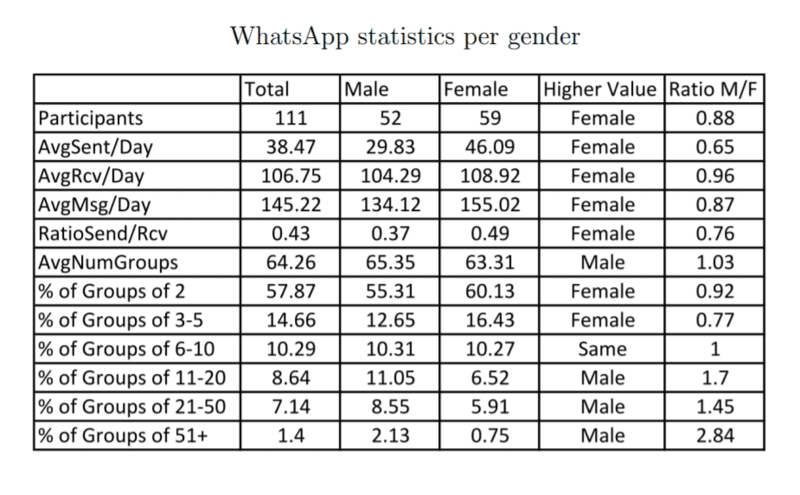 55% of the Indian WhatsApp users are male while the rest or females. As per the statistics explained above, WhatsApp popularity has now become a global phenomenon and it is gaining similar popularity in Latin American countries too. Such as, Brazil’s internet penetration stands at 66% while in Mexico, the penetration rate of WhatsApp is 91%. Moreover, African countries have also been dominated by WhatsApp. In fact, due to WhatsApp, the usage of internet has increased in Africa, such as, WhatsApp is responsible for 50% of data usage in Zimbabwe. 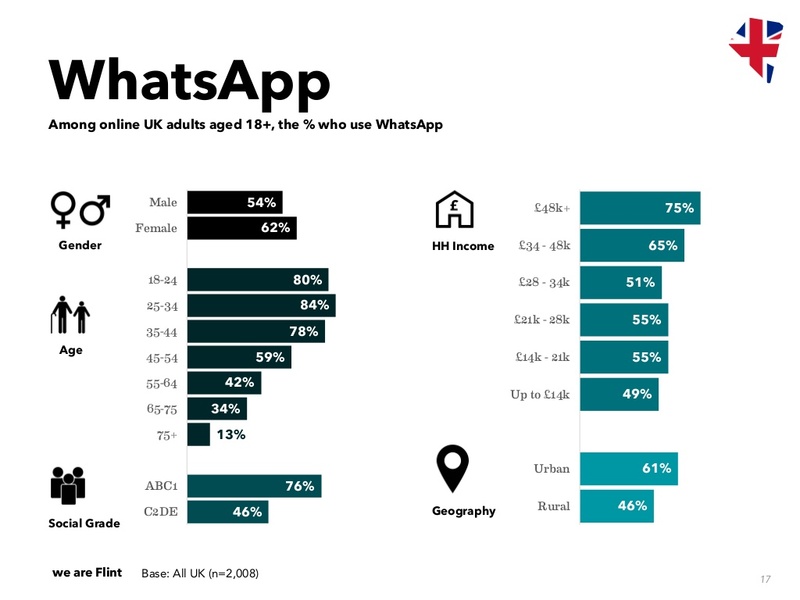 In the United Kingdom, a total of 84% of 25-34-year-olds using WhatsApp while in the 18-24 age group, this ratio is 80%. In the 35-44-year-olds, the WhatsApp usage is almost similar to the younger groups and a decline can be witnessed in the age group of 45 and more. Moreover, the same criteria are applicable across income and social grades. Such as, there is a great difference of WhatsApp usage between the users from a rural and urban area. Furthermore, it applies to users with higher income brackets or white-collar professions, etc. And yes, in women, the usage is higher than the men. 54% of the males are using WhatsApp while 62% of the females are using WhatsApp. 75% of the people with over a household income of 48000+ Pounds are the major WhatsApp users. Hispanic Americans are topping the list with about 50% of WhatsApp usage while the Black users have the lowest penetration rate that is 14%. Moreover, the White users have 21% of penetration rate. WhatsApp was available in China until 2017 but was blocked by the government. Still, it was unable to compete with domestic Chinese services such as WeChat and QQ. In the footprint of Instagram, WhatsApp also introduced a “Stories” feature like a “Snapchat Stories” feature that is known as status. This feature enables users to share their stories like images and videos that disappear after 24 hours. Interestingly, this feature eclipsed Snapchat and WhatsApp got about 300 million users by the end of 2017 while the figure was increased by 450 million in May 2018. In January 2018, WhatsApp launched its Business edition in five key markets initially i.e., the US, UK, Indonesia, Mexico, and Italy. Amazingly, within in four months of launch, 3 million businesses signed up for a business account. The purpose of WhatsApp Business was to facilitate the small and medium business owners and provide them with better communication features with their clients. WhatsApp Business enables users to create profiles with useful details as well as some advanced messaging features that include automation and sorting messages. Moreover, the messages sent through WhatsApp Business are encrypted. WhatsApp did not stop here and launched the WhatsApp Business API in August 2018 that enabled businesses to respond to the customer’s messages. While using the API, the businesses could reply for free within in the 24 hours after the message was received, after that, they have to pay a per-message fixed rate. It is the first-ever revenue-generating enterprise product from WhatsApp. Also, the API is equipped with several useful features that include reminders, confirmations, and tickets. One thing to be noted here is that WhatsApp Business is still free to use but WhatsApp has plans to monetize it in the near future, most probably, they’ll charge bigger businesses. In the home ground US, WhatsApp still has much more to achieve. Unbelievably, only 8% of smartphone users use WhatsApp. The major share goes to Facebook Messenger that is 37% while 22% of the users use Instagram. 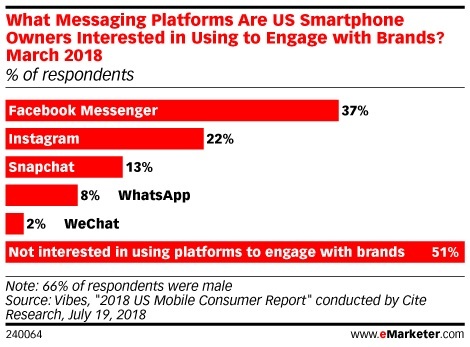 Overall, most of the users were not interested in any one of the messaging apps to communicate with the brands, yes, 51% of the users have neglected the importance of messaging apps. In early 2018, WhatsApp introduced a new payment feature in India for selected users and by the end of 2018, they touched one million users. In accordance with NCPI (National Payments Corporation of India), WhatsApp enabled its users to transfer money to their WhatsApp Wallet from their bank accounts. In late 2018, WhatsApp requested to The Reserve Bank of India to expand their payment system across India but this system is still not implemented. According to the reports, NCPI was not satisfied with the assurance given by WhatsApp that the data would not be stored overseas. Moreover, WhatsApp was asked to set up their headquarters in India before they can expand the payment system across the country. So, WhatsApp recruited Abhijit Bose as the head of WhatsApp India. As per the experts, the payment market in India will worth around $1 trillion by 2023. Currently, Alibaba-backed Paytm is leading the payment market. Now we have some interesting statistics provided by WhatsApp and other companies. Let’s have a look over them. As of May 2018, a total of 65 billion WhatsApp messages sent by the users daily. That means, 29 million WhatsApp messages per minute on average. The users spent 2 billion minutes in making video calls and voice calls daily. In 2017, the WhatsApp users made 55 million video calls daily that lasted for 340 million minutes. Between May and July 2018, the total usage of WhatsApp was 85 billion hours. The nearest app was Facebook with 31 billion hours spent. UK has a great edge over the US as 58% of the users are using WhatsApp in the UK while in the US, this number is just 24%. When it comes to daily usage, in the UK, 35% of users use WhatsApp daily while 10% of the US-based users use the app. A small study carried out in university-age students gives us the following statistics. 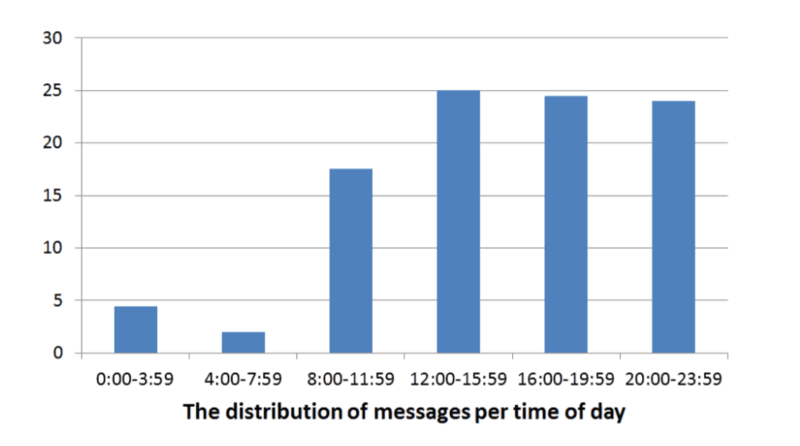 On average, female users were found to send more messages per day. Both females and males have the same numbers of groups on WhatsApp. The study, furthermore found out that on average 70% of the groups have at least 2 people, 10 of them contained 3, and just 1% of the groups contain more than 50 people. When it comes to response time, more than 57% of users reply within 1 minute after they receive the message while 2.79% of the people reply between 31 minutes to 1 hour after they receive the message. Interestingly, 20.86% of the users don’t even reply to the messages. As per the survey conducted by MAFAT and The Israel Science Foundation, following are the most active time frames on WhatsApp. WhatsApp and Facebook are among the least trusted news sources as compared to traditional media because 61% of the people don’t trust these social media platforms. 29% of the users trust WhatsApp that may result in a harmful outcome. To prevent any hype and tragedies, WhatsApp has now put a restriction on forwarding messages in India because Indian users forward messages more than any other nation in the world. The study further revealed that 55% of the users trust the news published in a newspaper while 50% of the people said they rely on TV news. WhatsApp is still the largest acquisition of Facebook as it was acquired for $19 billion in 2014. Facebook does not release its revenue stats separately, therefore, it is difficult to give an exact figure of WhatsApp’s revenue. But as per the released stats, Facebook earned $41 billion in 2017 while in the 4th quarter of 2018, the revenue was $16.91 billion. When Facebook acquired WhatsApp, it charged $1 per year starting from the second year of purchase in some markets that generated $1.3 million. Later WhatsApp announced to scrap this charge in 2016. In a report, Forbes predicted that WhatsApp will get 1.3 billion users by 2020 and it will generate the revenue of $4 per user, a total of $5 billion. But amazingly, WhatsApp attained 1.3 billion users in mid-2017 while the revenue was up to $15 billion that is $12 per user. Interestingly, it looks like WhatsApp’s newest rivals are mobile operators as it is coming up against traditional SMS messaging. In 2017, mobile operators generated $9 billion from business messaging and it can rise up to 84% by 2022. Regardless of all the negative points, mobile operators have an edge on WhatsApp because they can reach all the mobile devices. Moreover, the payment system introduced in India has also been a source of greater revenue that can be expanded to other markets accordingly. For instance, we can take an example of Alipay and WeChat Pay, as both the payment operators handled the transactions worth 81 trillion Yuan from January to October 2017. In 2016, WeChat Pay handled about $2 trillion while Line handled $6 billion. Still, data security is the biggest concern because of Facebook’s controversial history in this regards. Due to this problem, both the founders of WhatsApp resigned from the company and found a new rival app named “Signal”. Their focus will be security and privacy in this new app. The two major investment which WhatsApp received before it was acquired by WhatsApp were $8 million and $52 million. These investments were made by Sequoia Capital, a tech-focused venture capital firm. And as per NY Times, they were paid off a handsome output of around $3 billion. Moreover, an investment of $250,000 was also made by ex-Yahoo employees which were raised by Brian Acton, the co-founder of WhatsApp. Fact: Whatsapp bans around two million fake accounts each month. WhatsApp is undoubtedly one of the most popular apps as it is loaded with such features that cannot be achieved through traditional SMS messaging. Still, for many, data privacy is the biggest concern because Facebook does not have a good record in this regards. It looks like, acquisition of WhatsApp was the smartest move of Facebook because it could be the major rival of the social media giant. In the near future, WhatsApp is going to become a more major part of businesses because WhatsApp is focusing on Mobile Payments and WhatsApp Business. Their target market India has shown a great interest in payments that means we’ll witness more regarding this in the near future. WhatsApp is truly the most revolutionary tool that has changed the way of communication and has become an alternative of mobile carrier in the markets where they charge too much. For now, it is impossible to imagine a world without WhatsApp and Facebook.